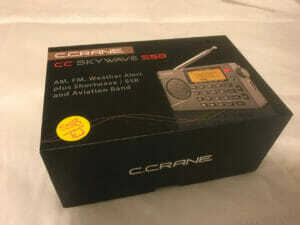 So what we have in the package is an AM/FM/SW/AIr Band/Weather radio in one TINY package that is pretty easy to use. Sign me up! Okay Pros and Cons time. Sorry for the redundancy. Decent LCD screen that you can see at varying angles. Seems to be a mute between frequencies which made it annoyingly slow to search for 40 meter hams on SSB. Click, wait, click, wait, click, wait. To be honest, I’m not sure this radio is worth $170 without an external antenna connector and a Line Out jack. Lets face it, if this radio had those two features it would be worth every penny of that $170. And I realize that having those things means a little more size and heft. Even without the external antenna the ShortWave performance isn’t bad and of course I’m in a house in a low signal area. Next time I go camping and I’m out in the middle of nowhere on the big lake I’ll bring this thing and see how good a reception it gets when I’m not surrounded by computers and routers and other sources of interference. And as always I threw together a little video of a demonstration of the SW / Air / Weather bands on the radio. You can’t go wrong with this radio but for the money you could get a Tecsun PL-880 that has it all. If this radio cost $90 it would be more palatable. There’s a way to add a LINE-OUT to the Skywave if you’re good with soldering the tiny leads on flat-pack ICs. I’ve added a line-out to this radio by identifying the line-level audio pins from the DSP chip’s data sheet (you can find them on the SiLabs web site). I forget the specific chip # in the Skywave SSB, but if you try Google it can be found. I soldered wirewrap wire to the appropriate pins, and took audio and ground to a small headphones jack on the side of the case. Then you have a mono audio source for recording, etc. Funny, I was playing with the original Skywave not too far from your location. My son lives down there (at one time in the Copperfield Apartments!). Last visit we were over in James City at the Comfort Suites, right across from Craven County Airport. So close, I was able to get their weather frequency! Great city, good radio and I hope you survived Florence. Thanks Jack. Oddly enough the weather channel was knocked out during Florence. Lot of help that was! I travel to South America and Asia, and have been looking for a quality small shortwave replacement radio for another that was destroyed. The PL-880 seems better, especially as it has an antennae jack, but it weighs well over double what this one does. I try to keep my carried weight down as much as possible. I guess I’ll just have to wrap external antennae wire around it. Does anyone know of a way to add an external wire antennae plug in? Could I solder one onto the small external antennae of this radio?